You can enquire about the past sales and purchases of a particular product or product range. The Product Enquiry operates in a similar manner to the Account Enquiry, to which you should refer for a complete discussion. 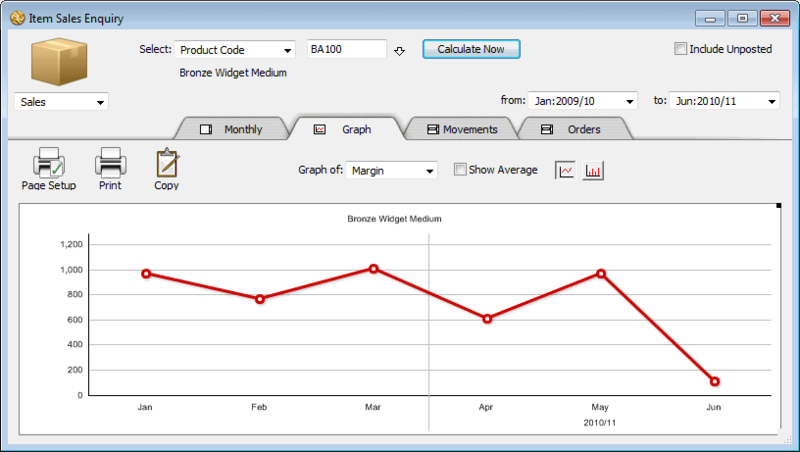 The Product Enquiry window will be displayed. This works in a similar manner to the Accounts Select menu. The sales information, including margins if available, will be displayed for the product on a period by period basis. If you want to see the effect of any unposted transactions, click in the Include Unposted check box. If you type in an incorrect code the product choices window will be displayed. Double-click on the product required to enter it. You can drill down to see the transactions for a particular period by holding the mouse over the row for the period and clicking. The pop-up menu determines whether to show sales or purchases. The same screen can be used for either sales or purchases. The purchases for the product will be displayed. A graph of the product sales/purchases is shown. You can graph quantity, cost, net sales in dollars, the dollar margin and the percent margin for sales. For purchases you can graph the quantity or the cost. You can drill down to see the transactions behind a data point on the graph by clicking on it. A list of all transactions for the product will be displayed. You can print, sort, sum, and rearrange this list in the normal manner. To adjust the period range, use the from and to pop-up menus. Any incomplete orders for the product will be listed—the Qty is the backorder quantity (i.e. ordered but not shipped).